I've named this dish on the strength of the fact that I made it with an excellent, dry, full cider from Herefordshire – rather than the beer that is usually used. I might just as well have concocted a Somerset rarebit with a few slugs of cider and a handsome hunk of Keen's Cheddar, also made in Somerset. The essential point here is that a good cider combined with a good cheese makes an extremely good rarebit. The difference between a rarebit and cheese on toast is that the unctuous cheese sauce is poured right over the toast so that it soaks in a little, settling right into the fabric of the bread as it sizzles under the grill. Preheat the grill. Arrange the toasted bread in a shallow, ovenproof dish. Put the remaining ingredients, except the tomatoes, into a saucepan and stir over a low heat until you have a smooth cream. At first it will seem wilfully lumpy and awkward, but don’t despair – it soon softens and amalgamates, as it should. 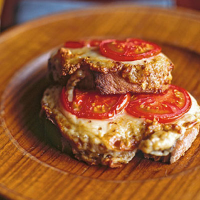 Pour the cream over the bread, lay the tomato slices on top, then whip them under the preheated grill until browned and sizzling. Eat as soon as you can without burning your mouth. Most traditional ciders contain an astonishing amount of sugar, even the so-called dry ones, which makes matching wine to cider-based cooking quite difficult. A lively English ale would work well, adding a malty tang to the dish.